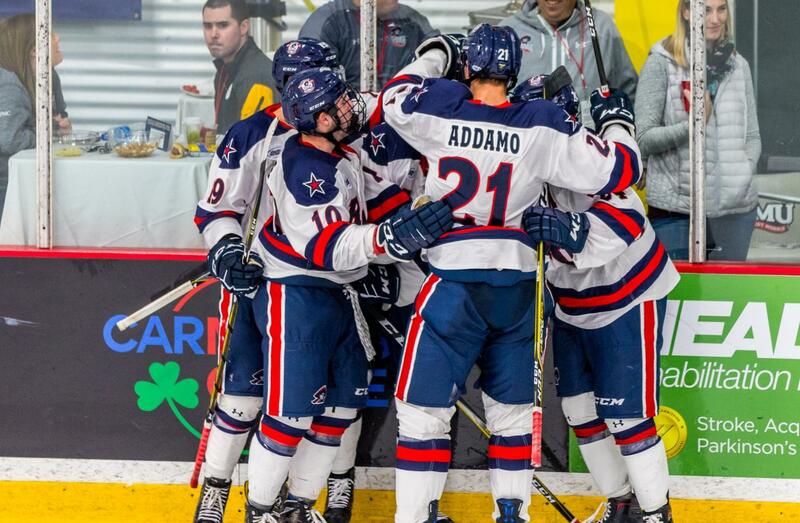 PITTSBURGH -- The Robert Morris Colonials celebrate after a goal against Bowling Green (David Auth/RMU Sentry Media). PITTSBURGH — After a loss and a tie to rival RIT (15-13-4, 13-9-4 AHC) last weekend, the Robert Morris men’s hockey team (10-20-2, 9-15-2 AHC) are prepping for their last series of the year; a home-and-home with the Mercyhurst Lakers (13-16-5, 11-11-4 AHC). As they look forward to not only the series against Mercyhurst, as playoffs come closer, there is a multitude of options to look forward in terms of matchups. Per RMU Athletics, the Colonials have the possibility of playing Sacred Heart, Mercyhurst, Niagara, Holy Cross and Army West Point. The team could also rise as high as eighth and host a opening round; or they could finish in ninth or tenth and start on the road. On the Colonials roster now, there are 10 players who used to play in the NAHL; Brendon Michaelian, Nolan Schaeffer, Aidan Spellacy, Sean Giles, Nick Jenny, Kip Hoffmann, Justin Addamo, Aiden Beck, Luke Lynch and Dyllan Lubbesmeyer.